Non-Stop offers some suspense, but a suspension of disbelief is required to get through the nonsense ending. Bill Marks (Liam Neeson, Taken) is a Federal Air Marshal taunted by a passenger threatening to kill one person every 20 minutes until $150 million are deposited into a bank account. It’s a bank account that just so happens to be in the name of William Marks. It’s a premise absolutely begging for a twist ending, something from The Twilight Zone. How the heck can someone get away with murder — multiple murders — on an airplane mid flight? It’s a decent setup for tension as Bill is seen being ever-vigilant, constantly observing those around him. Naturally, for his line of work, after a while even the most innocent of behaviors can take on menacing tones. As it happens, Bill himself has a dicey past. He’s from Northern Ireland, lost his 8-year-old daughter to cancer, got divorced, was fired from his job as a New York City cop, regrets the life he’s lived and has turned into a chain-smoking alcoholic. In short, he’s the perfect candidate for Air Marshal. Um. No. But move along and don’t ask questions. That sordid, pile-it-on back story sets up Bill as a terrorist gunning for self-enrichment. Or maybe there are other players at work. The co-pilot and his flight attendant lover, perhaps. The red-headed chick who insists on moving to a window seat. The Muslim doctor. The other Air Marshal. The computer programmer. The 8-year-old girl who dropped her Paddington Bear. Everyone’s a suspect on this non-stop flight from New York to London. 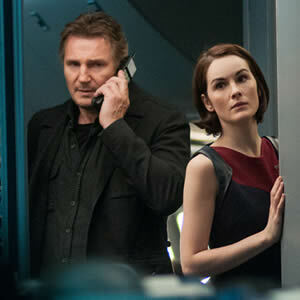 For a while, the movie works as a confined-space thriller, with a ticking time bomb to boot. On top of that, the bomb is stashed in a brief case and concealed within a package of blow. Consider it a witty touch. There’s also some cleverness in the execution of the first couple murders; maybe it’s a compliment to simply acknowledge it’s amazing the movie works as well as it does for as long as it does. But then things fall apart and all goodwill goes out the emergency exit. The climax is ludicrous. As in laugh-out-loud, you’ve-gotta-be-kidding-me malarkey. Thanks to the magical cocktail mix of gravity and air pressure, Bill turns into a contemporary Qui-Gon Jinn. The driving force behind the mayhem is a solid idea: America’s post-9/11 security is a lie and a false sense of safety has lulled people into complacency. The theme is certainly worthy of consideration, but the execution here is weak. Like the airplane disaster movies of yore, Non-Stop features a striking “all-star” cast that milks every Hitchcockian moment for more than it’s worth. In addition to Neeson, there’s Julianne Moore (Children of Men), Lupita Nyong’o (Academy Award nominee for 12 Years a Slave), Michelle Dockery (TV’s Downton Abbey), Anson Mount (TV’s Hell on Wheels), Corey Stoll (Midnight in Paris) and Linus Roache (Batman Begins). Each member brings a certain amount of eye appeal and acting credibility. Even so, Neeson teamed with director Jaume Collet-Serra with much better results in Unknown a couple years ago. Here they’re working with a screenplay by a trio of first-time feature film scribes - and maybe that’s what ultimately grounds this non-stop flight into what should be intense territory. There simply isn’t enough storytelling expertise to navigate the turbulent climax.